However, especially in a crowded and complex industry like healthcare software, we would strongly advocate a marketing strategy that includes a full marketing mix, using both inbound and outbound marketing techniques to create a cohesive, convincing brand message to reach and engage as many leads as possible. In this article, we’ll look at the pros and cons for inbound and outbound marketing, and show why healthcare SaaS companies should be using both in their marketing plans. It can be highly targeted. For instance, unlike outdated mass email campaigns, today’s email marketing outreach can be extremely personalized and effective. Steven Coufal, Senior Media Relations Specialist at Gartner, comments that email marketing “used to consist primarily of large-scale, one-off email blasts, but now the technology has moved to the point where marketers can hyper-target small subsets and even individuals with very focused content tailored to their specific interests.” In the case of healthcare IT, targeted emails could help you reach the multiple buyer personas involved in purchasing decisions with segmented email campaigns. Your ROI is easier to measure. Most forms of outbound marketing - such as social media advertising, banner ads on industry sites, or print advertising - allow for easy tracking of lead behavior. For example, using a specific link from each ad campaign and tracking what your lead does, from the moment they click the link to whether or not they purchase, means that you can check if your marketing budget is being well invested. It may require less time and labor investment. Inbound marketing can take time to build up, and may be labor intensive. While your outbound ad campaign could potentially start attracting leads to your website as soon as it goes live, establishing your brand as an authority in the healthcare IT space can take months, especially given the large resources of the competition and the conservative nature of the market. Online advertising is getting harder, thanks to the increasing popularity of ad blocking software. A recent report by AdBlocker Plus found that 40% of laptop users and 15% percent of mobile users are blocking ads, and 90% of viewers skip pre-roll video ads. Leads may be lower quality. HubSpot reports that 30% of marketers think outbound marketing tactics are overrated. 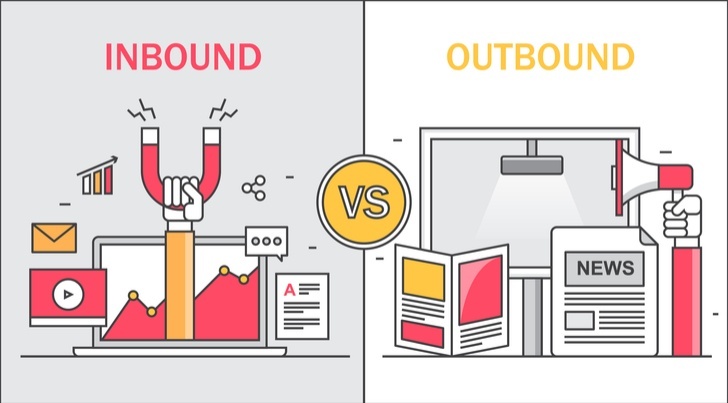 This may be because leads generated by outbound techniques are perceived as being lower quality than inbound leads. Inbound leads tend to be “warmer” than outbound leads - they’ve spent more time getting to know your brand through your content and are therefore more predisposed to buy. Inbound marketing, also often referred to as content marketing, involves attracting leads to your company by offering them valuable content, instead of hunting them down with ads or direct outreach. Inbound marketing can be described as “pull” marketing - you draw leads to you rather than “pushing” your product on them. It is consent-based - in other words, you only tell people about your business after they have given you permission to do so. If you’d like to see more of their findings, watch the HIMSS webinar here. HubSpot reported that teams who focused on inbound marketing were 13% more likely to rate their marketing strategy as effective. Marketers also reported a higher return on investment from inbound than outbound techniques: 53% of respondents agreed that “inbound marketing gives us a higher ROI.” The Content Marketing Institute claims that inbound marketing also gets three times more leads than paid search advertising. Invespro estimates that “inbound leads on average cost 61% less as compared to outbound leads and 3 out of 4 inbound marketing channels cost less than any outbound channel.” Your main cost with content marketing is the manpower required to create high-quality content - even if you have to outsource content creation to a freelance content marketer, your costs will usually be significantly lower than running an advertising campaign. It helps build brand awareness. This is especially critical in healthcare IT marketing, where authority and trustworthiness are at a premium. An HIMSS study found that almost all healthcare software buyers had taken action (such as initiating a purchase discussion or sharing information with colleagues) after engaging with high-quality healthcare tech content. Not all inbound marketing is created equal. Healthcare IT purchasers look for valuable content that displays industry knowledge, relevant case studies and specialist information - and over 90% of those surveyed by HIMSS reported that they found it hard to find. This is not surprising - premium content takes time and expertise to create, and not every company has the resources available to provide it on a regular basis. It requires consistency over time. Building an effective inbound marketing strategy takes a lot of work, and may take weeks, or even months, to start delivering results. A solid marketing calendar can help keep you consistent, but it can still be hard to find the time - especially when it’s hard to measure the direct relationship between your efforts and the leads you’ve generated. A successful marketing strategy for healthcare software should include both outbound and inbound techniques, working together to create a skillful, coherent, and engaging message. If you’d like our help building a stronger marketing plan for 2019, just click here to schedule a free 30-minute consultation with our team.